Magnets play a vital role in everyday life and scientists have already been able to study the structure of thin films of magnetic materials. London: A new imaging technique has helped scientists make a breakthrough in how they visualise the directions of magnetisation inside an object. 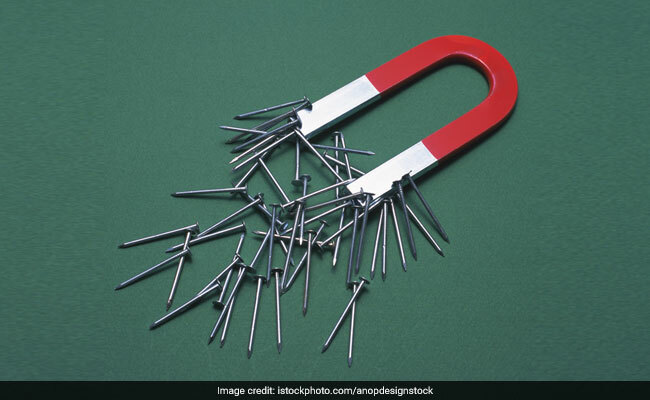 Magnets play a vital role in everyday life, are used in everything from hard drives to energy production, and scientists have already been able to study the structure of thin films of magnetic materials. However, imaging the inner structure of thicker forms of magnets had remained an experimental challenge until now. A better understanding of magnets could contribute to the creation of better motors, more efficient energy production, and hard drives capable of holding more data. In a new paper published in the journal Nature, scientists based in Scotland and Switzerland describe how they have used tomography and high energy X-rays, combined with a novel reconstruction algorithm, to peer inside and reconstruct the magnetic structure of a micrometre-sized 'pillar' of gadolinium-cobalt magnetic material for the first time. The scientists, from the University of Glasgow and the Paul Scherrer Institute and the ETH Zurich in Switzerland, observed complex internal magnetic patterns and quickly realised that they consisted of tangled fundamental magnetic structures. They were able to see "domains", or regions of homogenous magnetisation, and "domain walls", the boundaries separating two different domains. One specific kind of structure stood out and gave additional significance to the scientists' results: a pair of magnetic singularities, or so-called 'Bloch points'. At a Bloch point, the magnetisation abruptly changes its direction and locally points in all possible directions on the surface of a sphere, reminiscent of the spines on the back of a curled up hedgehog. Bloch points were predicted theoretically in 1965 but the structure directly surrounding them has only now been observed with these new measurements. The structure of Bloch points, like that of other singularities, such as black holes in space, can be measured through the effect they have on their surroundings. The team has measured particular configurations - twists in the magnetisation - that had been predicted to give away the presence of the singularities. Sebastian Gliga, Marie Curie Research Fellow at the University of Glasgow, played a key role in interpreting the measured magnetic structure based on micromagnetic theory and state-of-the-art simulations.